On this day many years ago I chose to pop into a human form and come and play on planet Earth for awhile, why not!? Some called this my Birthday. Yet I have observed that every single day, every sacred New Moment is yet another opportunity for a Re-Birth Day. We are not stagnant humans held within this one Reality or Dimension. We are Multi-Dimensional Spiritual Beings of Love and Light, and hopefully for the most part we are enjoying our human experience. I like to point this out because so often we are conditioned and taught that we are held, attached and bound by those we first meet upon entering this human form. For many, this is their reality because they feel that it is all that is possible, or is honorable to be bound by blood. And so often even when they are abused, disrespected, and enslaved they cling to their tribe. I can only speak from my own heart and from my own personal experiences (because I have lived them) and am here to Illuminate these “old” programmed beliefs and limitations. Of course, if you’re enjoying your bindings then by all means keep them. However, if you’re a shape-shifting, life transcending soul like mine then perhaps you have come here for very different reasons. We are all given the gift of Life, now what we choose to do with this gift is for us to choose alone. For many souls have come here on planet Earth at this time for the very purpose of evolution and expansion. If we remember that we are first and foremost Non-Physical Energy, One with Source God, and that Physical Energy manifests after this Alignment…Then, at a soul level our ultimate reason for BEING would be for Evolution, Expansion and Experience! If we forget that we are primarily Non-Physical Energy and we lose ourselves in our human, egoic mind structure, then we are easy to program, and then control–and very soon, after we make such agreements the feeling of enslavement arises. We start to make choices, most of our choices from fear rather than from Love. We are led by the Egoic mind chatter rather than by our heart’s wisdom and knowing. We choose to play it safe, tseek security, seek another to take care of us, and even if they do not honor us. We draw our energy in and we hide out in our human form, often times completely denying our very own Soul. We forget our connection, we forget our power, we forget our Soul’s purpose. Inevitably, we suffer greatly from such choices. However, as I have chosen to come here as a messenger of Love I am here once again reminding any o you who are open and receptive That You Are Free Now!!! You Are One with Source God Always, You are One with Consciousness and You are Free Flowing, Ever changing Non-Physical Energy. When we really remember this truth, nothing can hold us back, no one can control us; We live fearlessly, boldly and authentically! So why are so many humans suffering? Why do so many stay in abusive families, with abusive partners? Why do so many humans have addictions that are destroying their bodies and their minds? Ultimately, Fear is the simple answer. At some point not long after our birth and entry into our human form we start to form an Egoic mind, we form the I…the Mine! We start to observe the hurting humans around us that cling, manipulate and control, all in a desperate game of getting Energy. And if we are not very Present, extremely Aware, we start to follow these hurting humans right into the cave of suffering and darkness. We slowly start to slip into Spiritual Amnesia and forget WE ARE INFINITE SOURCE ENERGY!!! Rather than tapping into Source for our answers, we start spinning out of control desperately seeking the answers”Out There.” Rather than Honoring our own inner knowing and Intuitive guidance we allow others who lie and deceive themselves as well as others to lead us. Rather than taking risks and following our hearts guidance, we slowly suffocate in the land of security and predictably. We play it safe, we ignore the calling of our soul, our authentic heart song and we slowly suffocate and both fear dying as well as racing towards it. We become consumed and enslaved by the Collective Insanity of Humanity. We start to lie to ourselves and then do our best to convince others to believe in our lives, we love to build teams and groups, gangs, clubs and tribes where we can generate “Specialness” and “Separation.” We completely identify with Egoic mind/Pain Body/Unconsciousness. We slip into human amnesia and get lost for awhile. Don’t worry however if your spirit has led you here and you’re reading this right now…There is hope for you! Your soul is ready to Awaken, your soul is ready to be heard, your soul is ready to be honored right here, right Now…In case you didn’t realize it…It’s Your Very Very Re-Birth Day Whoooo Hoooo!!! How exciting right! This now moment offers you All you need. This now moment offers you a choice. A choice to live authentically starting right Now! A choice to speak YOUR truth (not what “they” told you) right Now! A choice to Love Your Self (regardless if “they” Love You) right Now! A choice to move in New Heartfelt directions right Now!!! You have soooo many FREAKING Choices!!!! Of course you also have the choice to keep telling yourself that you’re powerless, stuck, unworthy, unlovable, or not enough. You can choose to stay shackled to humans that abuse you, shame you, take from you, dishonor you, lie to you, and manipulate you. That is certainly a choice! These choices matter, ohhh baby do they matter, to YOUR Soul’s Evolution, to YOUR Soul’s Expansion, to YOUR Soul’s Joy, Happiness, Freedom and Liberation. They Absolutely matter! So know this…Today is Your New moment. 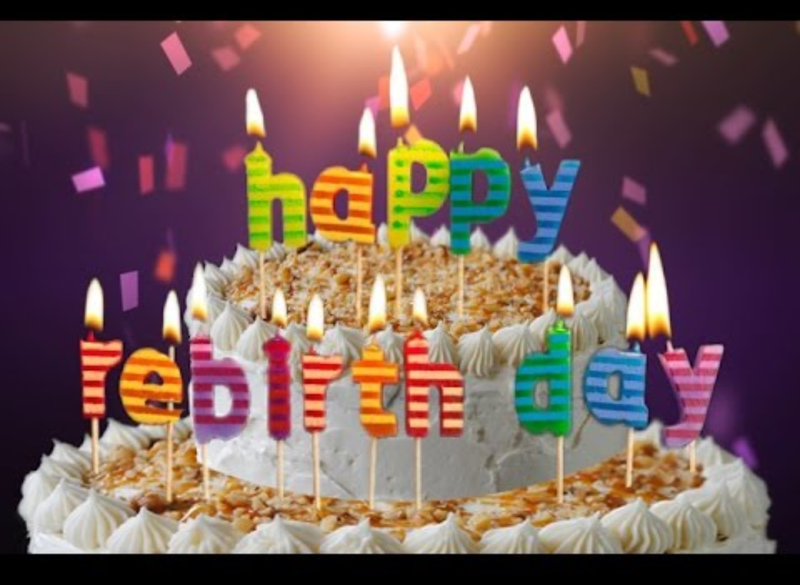 Today is Your Re-Birth Day! Now what are you going to do with such a sacred gift? I encourage You to take out a piece of paper and draw a line straight down the middle. On one side write out on the top, “my fears, my shackles of enslavement…” On the other side write, “My Hearts True Authentic Desires,” now without straining just allow your pen to flow as you write out any and all limiting, enslaving thoughts, behaviors, addictions, people, environments… Whatever is ready to be brought into the Light for Transformation. Then allow your pen to flow with every single Sacred Dream, and Heartfelt desire without any limitations or excuses. You’re just allowing yourself to SEE and bring into the Light YOUR True Soul’s Desires, not anyone else’s–Yours! Once you’ve completed this list hang it up somewhere you’ll see it often every day. Be gentle with yourself as you clear, release and let go of all the limitations and fears. Be gentle with yourself as you take more risks and put your dreams into physical action…Dream as Big as your heart and soul desires…There are No limitations, so have fun with this Awesome Shapeshifting Experience!!! Ready for more Awesome excercises like these? Ready to have a compassionate Intuitive Coach and Mentor to work/play/Shapeshift with? I AM READY when You are! View my thriving services here and contact me to schedule your special one-on-one Session Today!! !